It is estimated that around 1-1.2 million installations of rep­lace­ment glazi­ng are carried out every year. It is critical to have a way to ensure that the installation is carried out properly without an unreasonable increase in the administrative and financial burden on installers or property owners. A sample of the work of every installer will be inspected by FENSA appointed inspectors to ensure standards are maintained. FENSA will also inform local authorities of all completed FENSA installations and issue certificates to householders confirming compliance. 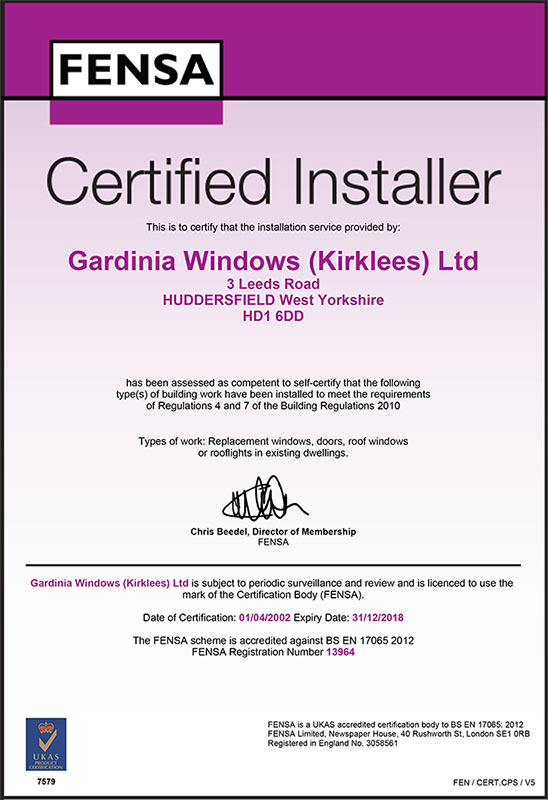 Any installation carried out by a firm which is not registered to self-certify, or is installed as a DIY project by the householder, then this installation will need full local authority approval under the Building Regulations. The local authorities will know of all the approved installers in their areas and will be able to identify unauthorised work very easily. You should note that you, as the house owner, are ultimately responsible for ensuring the work complies with the Building Regulations. Before you sign any contract to buy replacement glazing, be sure to enquire if the installer is able to self-certify. If not, either they, or you, will need to make an application to your local authority for approval under the Building Regulations and pay the relevant charges to the authority. Any deposits placed with a FENSA registered Company are protected by an indemnity scheme, which is backed by Q.A.N.W Services Limited and Guarantee Protection Insurance Limited who are authorised and regulated by the Financial Services Authority. When or if you choose to sell your property, the solicitor will ask for proof of any work carried out on your property in relation to windows and doors, so as to satisfy the purchaser that the work has been carried out in accordance with the current regulations. You will not be able to get a certificate from the installer, it has to be sourced from FENSA or the local authority, and the cost could be higher than if you register the work at the outset. It follows that your solicitors charge will also increase too, as they will have more work to do to satisfy the purchaser of your property.